Earlier this month I spent an enjoyable time on the Somme with a client, Roland Parr, who was following in the footsteps of his great uncle, John Thomas Davies VC, 11th South Lancashire Regiment. Roland had commissioned me to produce a detailed report on his great uncle in order that other family members could know more about this man, his war and the actions that led to the award of his Victoria Cross. Over the past few months Roland had accompanied me to the National Archives to look at war diaries from Division, Brigade and Battalion level. We also visited the Imperial War Museum to work in the Department of Documents and to have a good look at the new(ish) Lord Ashcroft Gallery which holds the original VC of Jack Davies. It must have been a somewhat surreal experience for Roland to be looking at the actual VC in its hermetically sealed case when he remembers holding the medal as a young boy. All of this was the precursor to our visit to the battlefields to follow ‘Uncle Jack’ around the western front. We set out from Peronne and began our pilgrimage at Maricourt, a village that Jack Davies and the rest of the 11th South Lancs would have known well from their time here in 1916. The battalion were the Pioneers to the 30th Division. 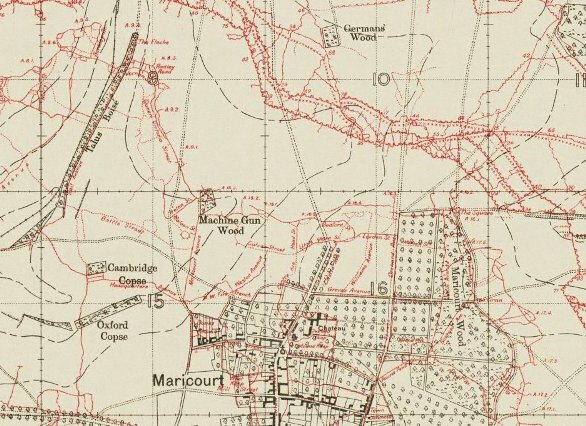 I had found a map showing the trenches in this sector dug by the battalion during the month of July 1916. I also noted that they had opened out some of the Russian saps dug by men of 183 Tunnelling Company RE. All of these sites could be viewed in the fields in front of us. We stood at the site of the British front line on the quiet road to Montauban with Machine Gun Wood on our left and Germans’ Wood to our front right and imagined what this scene looked like on 1 July and the subsequent days and weeks as battle moved on in this area. Panorama from British front line looking towards the village of Montauban on the right hand side - an objective for the 30th Division. Machine Gun Wood can be seen on the left of frame. After Montauban we stopped at the 18th (Eastern) Division memorial at Trones Wood. The 11th South Lancs had been working in the wood in the latter half of July 1916. We then spent a pleasant few hours on a tour of the battlefields – all south of the Ancre. Stops included High Wood, Ulster Tower and the Pope’s Nose and the Thiepval Memorial. I was also able to give Roland a good look around the Glory Hole at La Boisselle. After stocking up on a picnic lunch at the Old Blighty Tea Room at La Boisselle we headed back to Peronne and then down to St Quentin, focussing on the period from the German attack on 21 March 1918 through to the action for which Jack Davies was awarded his VC on the morning of 24 March. We visited the villages of Savy, Roupy and the small site of Epine de Ballon. Jack’s company (unknown) was in one of these locations prior to the German offensive. We then made our way to Fluquieres and from there to the high ground between Aviation Wood and Mill Wood. On the evening of 21 March 1918 the battalion dug and wired a defensive line through here, remaining for nearly 24 hours until on the evening of 22 March the order was given for all troops to withdraw in orderly fashion to Ham. Upon reaching Ham the battalion was told to billet in nearby Eppeville. We had a good look around Ham, visiting the bridge over the Somme Canal blown up by a detachment of Royal Engineers on the morning of the 23rd before driving west to Eppeville itself. This was the village, really no more than one street, intrinsically tied to Jack Davies’s VC story. After stopping at the Sucrerie (ironically now owned by a German company called Südzucker, the largest sugar producer in Europe) we continued west and crossed the railway line, noting the positions held along the line by the battalion. Finally, we reached the field where two companies of the battalion were almost entirely surrounded on the morning of 24 March 1918. As is the way with so many sights of unimaginable bravery in the Great War there is nothing to mark the site as anywhere special – just a couple of grassy fields next to the road with a man-made lake behind them barring the way to the stream over which the survivors escaped. The field where Jack Davies performed the deeds which led to his VC award. 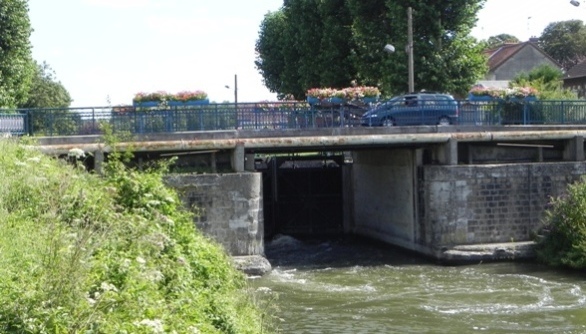 German troops had crossed the canal and were coming directly towards this spot. According to the after-action report compiled in the war diary it was in these two innocuous fields that Jack Davies mounted the parapet and kept his Lewis Gun firing until overwhelmed by the advancing Germans. For most conspicuous bravery and devotion to duty under heavy rifle and machinegun fire. When his company – outflanked on both sides – received orders to withdraw, Corporal Davies knew that the only line of withdrawal lay through a deep stream lined with a belt of barbed wire, and that it was imperative to hold up the enemy as long as possible. He mounted the parapet, fully exposing himself, in order to get a more effective field of fire, and kept his Lewis gun in action to the last, causing the enemy many casualties and checking their advance. By his very great devotion to duty he enabled part of his company to get across the river, which they would otherwise have been unable to do, thus undoubtedly saving the lives of many of his comrades. When last seen this gallant N.C.O. was still firing his gun, with the enemy close on the top of him, and was in all probability killed at his gun. Quite how and why he wasn’t killed remains unknown but it was only two months later, after his VC citation had been published in the London Gazette that word reached home that he was a POW in Germany. It was safely assumed that Jack was killed in the action and so the citation (above) is written as a posthumous record of his bravery. 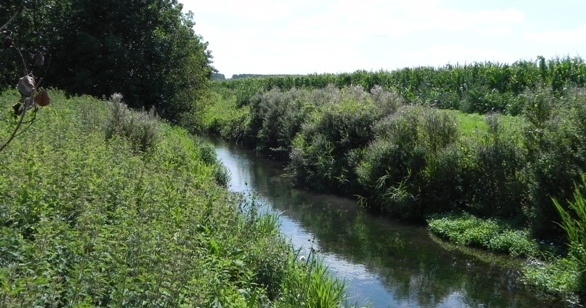 The "deep stream lined with a belt of barbed wire" over which the survivors of the 11th South Lancs escaped - now called the River d'Allemagne. Roland laid a small cross in the field and we then paid our respects at Ham British Cemetery where other men of the 11th South Lancs who hadn’t the same luck as Jack are buried. It was a spot I hadn’t visited before and I was taken by the two cemeteries – the British and Commonwealth cemetery directly next to the Muille-Villette German Cemetery. Ham British Cemetery. The black crosses of the neighbouring German cemetery can just be made out above the Portland stone headstones. A view from the German cemetery - the gravestones of German and British soldiers lie almost side-by-side. Before leaving I laid a cross at the grave of Lieutenant John Cuthbert Lidgett, 11th South Lancs in memory of all the men of the battalion who made the ultimate sacrifice. It had been a real trip to remember…. 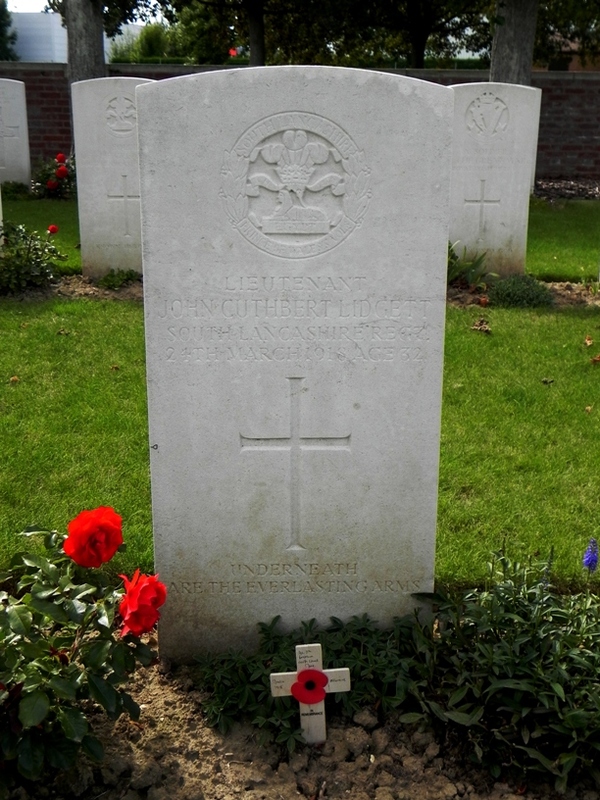 The grave of Lieutenant John Cuthbert Lidgett, 11th South Lancs in Ham British Cemetery. The cross was placed in memory of all the men of the battalion who made the ultimate sacrifice. What a wonderful day you provided for me, far exceeding my expectations for our time together. I mentioned the words ‘bringing alive’ and certainly you did that both for the 1 July 1916 action on the Somme and also Jack’s story from 21-24 March 1918. I have no idea how many similar stories you have so far put together, but I cannot think that anyone trying to trace the steps of a long lost relative would regret having made contact with you. If this is the source of your livelihood, then I can see nothing but success ahead.